Designed by Doug Ritter of "Equipped to Survive," the Adventure Medical Kits Pocket Survival Pak earned positive reviews from survival instructor Cody Lundin and many other back-country professionals. Toss it in the day pack, the backpack, or the pocket to make sure you've always got something useful on hand. The basic kit includes three approaches to making fire. There's a spark-generating permanent match, actually good for over a thousand high-energy strikes, plus a firestarter to help turn that spark into flame. On sunny days, you can save the permanent match and use the fresnel magnifier instead. Other handy items include a stainless steel signaling mirror and an emergency whistle that actually works. There's an inexpensive liquid-filled bubble compass, a scalpel blade, a six-foot length of stainless steel wire, and ten feet of braided 100-pound test nylon cord. The kit holds a sewing needle, thread, and a few safety pins for patching clothing. Waterproof paper and pencil allow writing those important signal notes if you have to abandon camp. You won't find a lot of useless stuff in this kit -- it doesn't fill every empty space with Band-aids, sugar cubes, or teabags, and does leave a little room for adding important items of your own choosing. Most people choose a folding water bag and water purification tablets, which are already included in the more expensive Pocket Survival Pack Plus. Although there's only a bare minimum of supplies here, the kit does include a waterproof survival booklet full of tips on how to use the gear. You won't use up the steel wire figuring out snares on your own if you just follow the step-by-step instructions. 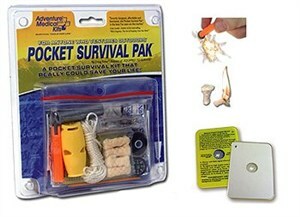 The Pocket Survival Kit Plus includes a skeleton-handled knife, a water bag, and a small supply of water purification tablets. For anyone who normally carries better versions of fundamental equipment, the original Pocket Survival Pack still offers the best deal. See the Bear Grylls Survival Knife for a set of survival tools that's more knife and less kit.